"This recipes is great for cookouts or get-togethers. 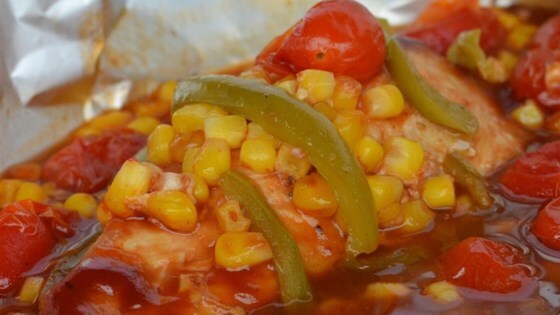 The chicken, corn, and green peppers blend so well with the BBQ sauce. A must-try for summer! You can alternatively grill the pouches for 12 to 15 minutes with grill cover down." Preheat an oven to 450 degrees F (230 degrees C). Spray 4 sheets aluminum foil with cooking spray. Center 1 chicken breast on each prepared aluminum foil sheet and top each chicken breast with 1/4 cup barbeque sauce. Layer corn and green bell pepper over barbeque sauce layer. Fold the sides of each aluminum foil piece over the top of each chicken breast mixture, double-folding the top and ends to form a seal on each 'pouch'. Leave enough space inside each pouch for circulation. Arrange pouches on a baking sheet. Bake in the preheated oven until chicken is no longer pink in the center and the juices run clear, 18 to 29 minutes. An instant-read thermometer inserted into the center should read at least 165 degrees F (74 degrees C). Open one end of pouch first to let the steam out before opening top. Very tasty! I omitted the corn since we were having corn on the cob with it. Cooked in 25 minutes and chicken breasts were very juicy.